There are many different types of fire rated glazing, using many different technologies to protect against the effects of fire. 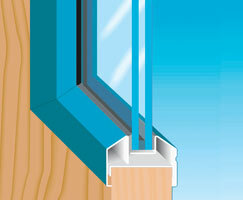 However all fire rated glazing falls into three basic categories. Fire Protective, Fire Resistive, and Heat Reflective glazing. SuperLite X-90 fire protective glazing can be used in doors with a max area of 100 sq. in. for up to 90 min. 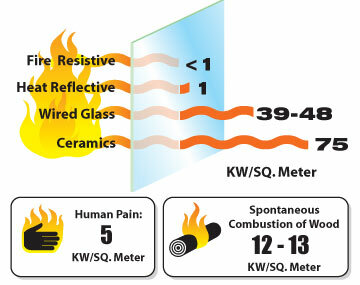 Normal glass will break under heat stress during a fire, allowing dangerous smoke to travel to surrounding areas. Fire protective glazing contains dangerous smoke and flame by maintaining its integrity during a fire. If the application is more than 25% of the wall area, fire protective glazing cannot be used. Fire protective glazing is allowed in applications over 45 minutes for doors only, and is limited to 100 sq.in. in this case. Fire resistive glazing contains smoke and flame during a fire as well, but also blocks radiant heat. Radiant heat can easily ignite materials on the non fire side of normal glass, and cause serious injury to people exiting a building. Only fire resistive glazing, such as SuperLite II-XL, protects people and property from the effects of radiant heat, and can be thought of having the protection of a transparent wall. Most buildings in fire prone areas use fire resistant materials on the roof and walls, but overlook the most important danger - radiant heat. Heat radiating from the fire through conventional windows will set curtains and other flammible objects on fire inside the building or home within minutes. Heat reflective glazing, such as SuperLite I-XL, is a speciatly tempered glass that reflects radiant heat like a mirror, protecting people and property on the non fire side. SuperLite I-XL does not pass the hose stream test and requires AHJ approval. Most AHJs recognize that the hose stream test was designed for structural building integrity and not as a thermal stress test for fire-rated glazing. Sprinkler activation does not compromise the performance of SuperLite I-XL. In 1977, A federal safety standard - Consumer Product Safety Commission 16 CFR 1201 - was established to protect people from injuries due to accidental impact with glazing. 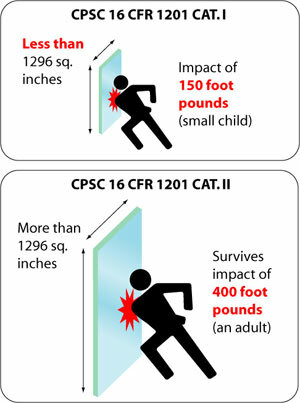 CPSC 16 CFR 1201 is required for all door and sidelite applications, and is recommended for any application where human impact is a concern. Tempered glazing products provide the best protection and durability. While non tempered products may meet impact safety standards by applying a film, they may still crack and need to be replaced after impact. SuperLite I, SuperLite I-XL, and SuperLite II-XL glazing uses tempered glass and is the best choice for areas where impact is a concern. Most buildings in fire prone areas use fire resistant materials on the roof and walls, but overlook the most important danger - radiant heat. Heat radiating from the fire through conventional windows will set curtains and other flammible objects on fire inside the building or home within minutes. Radiant heat can also prevent buiding occupants from reaching exits if the egress is not protected. In the late 1890s, cast and wrought iron were commonly used in construction. Unlike steel, they failed in a brittle manner when heated in a fire, creating a risk for firefighters. As a result, the hose stream was created to test the integrity of these support members. Currently, there is some debate as to how the hose stream test is applied to glazing systems. FACT: The hose stream test was developed to measure the structural integrity of a fire assembly - not the thermal stress performance of glazing materials. FACT: The hose stream test is not required for fire-rated constructions of less than one hour. NFPA 251, Standard Methods of Fire Tests of Building Constructions and Materials, specifically makes an exception for constructions rated less than one hour. Fire fighters along with code officials have stated their favor of a product like SuperLite I-XL, which does not pass hose stream, because it is quick and safe to remove in the event of a fire, allowing for access, smoke release and safe egress of occupants. "In my opinion the hose stream test is inappropriate for all glazing installations. It may be appropriate for glazing in exterior walls where the protections of openings is required because the development of through openings, i.e. breaking of glass, could permit flame travel. But, inside a building where the glazing may be in a corridor wall, the hose stream (as spelled out in the test standard) is not realistic." Consult the local Authority Having Jurisdiction (AHJ) to confirm whether the hose stream requirement is valid for your application. The Hose Stream Test: What it does and does not tell you about the performance of fire protective glazing materials. The Hose Stream Test... Safety Test or Sales Strategy? Thermal shock occurs when glass is rapidly cooled and areas of the glass are exposed to contrasting temperatures. The expansion and contraction of the glass causes stress and will shatter the glass if it is not designed to withstand thermal shock. All SAFTI FIRST glazing withstands thermal shock. These methods of fire tests are applicable to swinging door assemblies, including door frames with lights and panels, of various materials and types of construction for use in wall openings to retard the passage of fire. The method does not provide an evaluation of a swinging door assembly when that assembly is part of a larger assembly (e.g. sliding fire door assembly), or when it is intended to be used as an elevator entrance. Tests made in conformity with these test methods are intended to register performance during the test exposure; but such tests shall not be construed as determining suitability for use after exposure to fire. It is the intent that tests made in conformity with these test methods allow for the development of data to enable regulatory bodies to determine the suitability of door assemblies for use in locations where fire resistance of a specified duration is required. These methods are intended to evaluate the ability of a door assembly to remain in an opening during a predetermined test exposure. The tests expose a specimen to a standard fire exposure controlled to achieve specified temperatures throughout a specified time period, followed by the application of a specified standard fire hose stream. The exposure, however, is not representative of all fire conditions, which vary with changes in the amount, nature, and distribution of fire loading, ventilation, compartment size and configuration, and heat sink characteristics of the compartment. It does, however, provide a relative measure of fire performance of door assemblies under these specified fire exposure conditions. Any variation from the construction or conditions that are tested is capable of substantially changing the performance characteristics of the assembly. Full information as to performance of all door assemblies in walls constructed of materials other than those tested. Evaluation of the degree by which the door assembly contributes to the risk of fire by generation of smoke, toxic gases, or other products of combustion. A temperature limit on the unexposed side of the door assembly. A limit on the number of openings allowed in glazed areas or of the number and size of lateral openings between the door and frame. Measurement of the degree of control or limitation of the passage of smoke or products of combustion through the door assembly. Note: See limitations for the passage of smoke detailed in the Recommended Practice for the Installation of Smoke-Control Door Assemblies, NFPA 105. Achieved a Class A-1 rating per California Department of Corrections (CDC) 890-09a testing requirements. The innovative use of fire rated glass assemblies in lieu of opaque materials adds daylight, enacts passive solar design and enhances a buildings energy performance by reducing the lighting and heating loads. SAFTIFIRST SuperLite products can be insulated and provided in low-e or energy performance makeups which further improves energy efficiency. SuperClear 45-HS-LI has an approximate visible light transmission of 90%, compared to 88% for premium filmed ceramic and 85% for premium laminated ceramic. This makes SuperClear 45-HS-LI the clearest 45 minute, fire protective glazing product in the market today. SuperClear 45-HS and SuperClear 45-HS-LI are approximately half the price of filmed or laminated ceramics used in the same application. There are no additional costs from films, laminates or polishing, which are associated with fire rated ceramics. This product will be available within days, not weeks. SuperClear 45-HS and SuperClear 45-HS-LI performed better in an independent, third-party acoustical lab test against filmed and laminated ceramic in standard hollow metal frames. SuperClear 45-HS and SuperClear 45-HS-LI have a 37 STC/35 OITC rating in standard hollow metal framing, compared to 29 STC/28 OITC for filmed ceramic in standard hollow metal framing and 31 STC/30 OITC for laminated ceramic in standard hollow metal framing. Patented bi-directional specialty tempered glazing tested without hose stream that provides low cost bi-directional partial radiant heat protection and insulation not available with ceramics. Accepted by the GSA and AHJ’s across the country as a safe and value added alternative to traditional unsafe wired glass and expensive ceramics. Meets the highest human impact safety requirements. Approved for 20 minute applications without limitations. Regularly specified for use in exterior applications and perfect for property line requirements. Acoustical value of 33 STC and available in specialty architectural make-ups. USA manufactured for fast delivery and competitive pricing. 20 Minutes Steel Doors 3,341in² 35-1/8” 95-1/8” 5/8"
20 Minutes Steel Sidelites, Windows and Transoms 3,522 in² 48" 96" 5/8"
45 Minutes Steel Doors 3,341in² 35-1/8” 95-1/8” 5/8"
45 Minutes Steel Sidelites, Windows and Transoms 3,522 in² 48" 96" 5/8"
*Requires AHJ approval for these applications because it is tested without hose stream. SuperLite I-XL IGU is listed and labeled by Intertek/Warnock-Hersey Inc. and Underwriters Laboratories, nationally recognized testing laboratories approved by OSHA. Requires AHJ approval for 45 minute applications because it is tested without hose stream. Please visit www.safti.com/AHJ for more information. UL 9, UL 10B, UL 10C, NFPA 80, NFPA 252, NFPA 257, ASTM E152, ASTM E163, ASTM E2074, ASTM E2010-01, CPSC 16 CFR 1201 Cat. II. U.S. Pat. No. 5,910,620 This product requires AHJ approval because it does not pass the hose stream portion of the fire test.